Two 20-inch video monitors stripped of their housings are turned vertically and positioned like an open book on top of a white pedestal. (The back of the monitors’ tubes rest on vertical supports that are attached to the top of the pedestal, and wires from the monitors extend down inside the pedestal where the monitors’ electronics are shelved.) 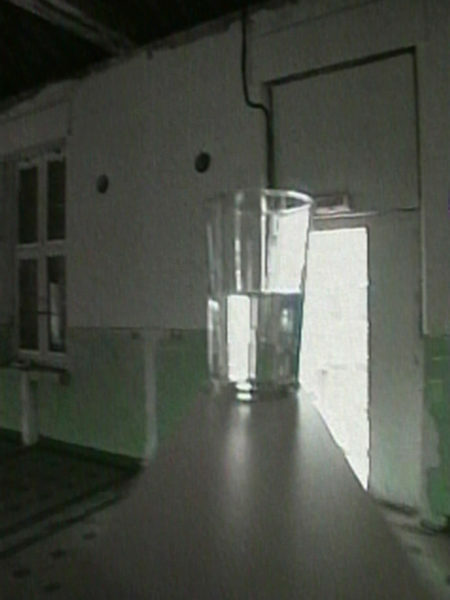 During the real time recording, the camera was placed on a board with a half-filled (half-empty) glass of water positioned on its end. Since the camera’s relative position to the glass never changes, the glass remains fixed in the approximate center of the image while the background moves through the frame normally. The two monitors display the same image, but one is delayed or in advance of the other, creating a wider view of the background with two glasses fixed in the foreground. When the camera changes directions, the images are swapped to maintain the illusion of a continuous background. The two images alternately flicker on and off since they are derived from a single source. This creates a highly agitated image that is offset by a disinterested voice reciting a variation on a childhood rhyme. 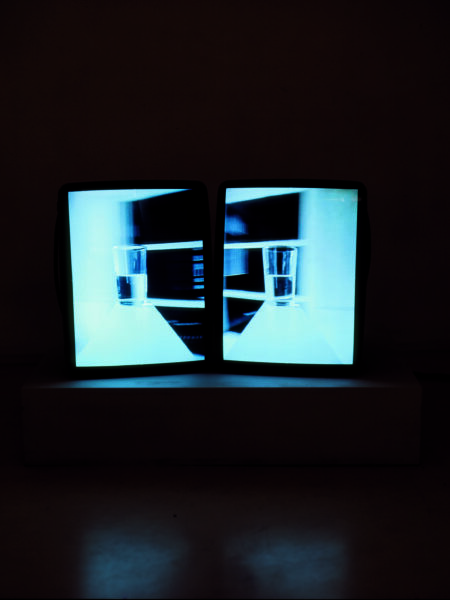 An example of this work was first exhibited at in a solo exhibition at Galerie des Archives, Paris, France, September 7 – October 19, 1991. Japan 92 Video and Television Festival: “Prospectus for a TV Art Channel,” Spiral, Aoyama, Tokyo, Japan, February 1 – 11, 1992. “Gary Hill: I Believe It Is an Image,” WATARI-UM, The Watari Museum of Contemporary Art, Tokyo, Japan, May 20 – August 12, 1992. 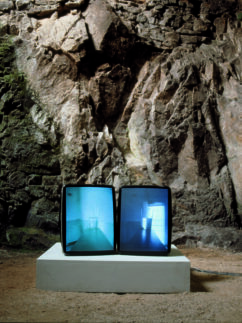 “Gary Hill: Remembering Paralinguay,” in SITU Fabienne Leclerc, Paris, France, March 10 – April 21, 2001. 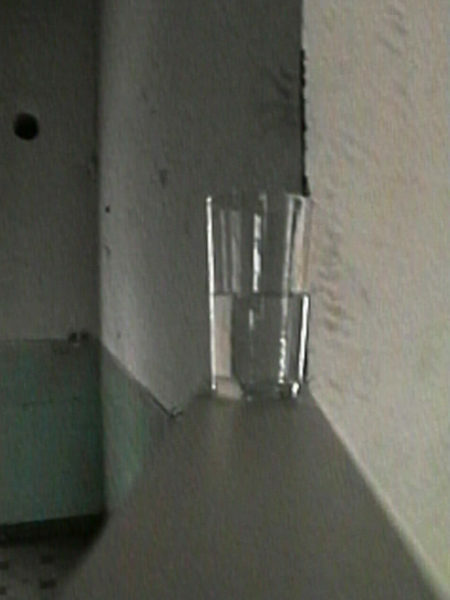 “Multiples objets de désir,” Musée des Beaux-Arts de Nantes, France, July 6 – September 30, 2002. Sarrazin, Stephen. Chimaera Monographe No. 10 (Gary Hill). Montbéliard, France: Centre International de Création Vidéo Montbéliard, Belfort, 1992, pp. 44 – 47, 60, 84. (Including an excerpt from an interview with Gary Hill). Van Assche, Christine. Gary Hill. Paris: Editions du Centre Georges Pompidou, 1992, pp. 12, 73. (Including an excerpt from Gary Hill, “Inter-view”). Cooke, Lynne, Bice Curiger and Greg Hilty. DOUBLETAKE: Collective Memory and Current Art. London: Hayward Gallery, 1992, pp. 159, 213. Sarrazin, Stephen. "La parole aux objets." art press 165, France (January 1992), p. 21. Gay, Jean-Jacques. "Surf, drogue et video." Museart 26 (December 1992/January 1993), p. 124. Van Assche, Christine and Corinne Diserens. Gary Hill. Valencia: Instituto Valenciano de Arte Moderno (IVAM), Centre del Carme, 1993, pp. 16, 47, 77. (Including an excerpt from Gary Hill, “Inter-view”). Grout, Catherine. "Gary Hill – La condition humaine de la pensee." Arte Factum 48 (June/July/August 1993), p. 11. Morgan, Robert C., ed. Gary Hill. Baltimore: PAJ Books / The Johns Hopkins University Press, 2000, pp. 36, 37, 87 – 90, 222 – 223, 297. Quasha, George and Charles Stein. La performance elle-même in Gary Hill: Around & About: A Performative View. Paris: Éditions du Regard, 2001, p. 118. Gary Hill: Selected Works and catalogue raisonné. Wolfsburg: Kunstmuseum Wolfsburg, 2002, GHCR 67, pp. 153, 154. Les Cahiers du FNAC #1: Multiples objets de désir. Puteaux: Fonds national d’art contemporain, 2002, unpaginated. Quasha, George and Charles Stein. An Art of Limina: Gary Hill’s Works and Writings. Barcelona: Ediciones Polígrafa, 2009, pp. 396, 573. Comer, Stuart, ed. Film and Video Art. London: Tate Publishing, 2009, pp. 6 – 7, 75, 85, 101.